It may not be advisable to simply buy-and-hold energy exchange-traded products, but rather as a tactical component of a portfolio. Over the past several months, we have been discussing various aspects of, and ways to invest in, the energy sector. Last month we examined the oil-tracking ability of four different exchange-traded products (see Investing in Oil ETPs: Should You Take the Chance?). We also learned that each fund applies a slightly different methodology, and why. Because ETPs that invest in oil are unique and complex securities, if you are not intimately familiar with the issues that influence their return, you are at a distinct disadvantage. In this article, we will analyze one of the most critical issues an advisor must understand before investing in an oil ETP. In short, we will get up close and personal with contango and backwardation, and evaluate the effect each has on this type of security. Last month we learned that ETPs investing in crude oil do so through oil futures. Because fund managers never intend to take physical possession of the commodity, they will always sell their contracts prior to expiration. Some managers will roll 100% of the proceeds into the following month’s contract while others spread the proceeds over several months. Why do managers differ on this point? Because investing all of the funds proceeds in the following month’s contract exposes the fund to greater contango risk. Conversely, spreading a fund’s assets over several month’s contracts minimizes the negative effects of contango. However, there is an upside and downside with both strategies. Because backwardation is a performance tailwind, if it is present, the fund that concentrates its assets in the following month’s contract should outperform the fund that spreads its assets out. The reason for this was discussed in last month’s article. In short, contango exists when the future price of oil is higher than the current or spot price. Backwardation is present when the future price is below the current price. The United States Oil Fund was chosen because it is the largest Commodities Energy fund in Morningstar’s ETP database and its prospectus benchmark is WTI. Additionally, each month the fund’s manager liquidates its contracts and rolls all proceeds into the following month’s contract. Therefore, contango or backwardation is the difference between the price of oil in the following month’s contract and the current price. This is expressed as CL2-CL1. During this period, contango was present 78.8% of the time. This is especially important since contango is a headwind to returns. Notice how contango spiked several times between late 2008 and early 2011. From mid-2011 to mid-2013, contango was relatively tame. Backwardation existed for most of 2014. Contango has been present since late last year. Now we will discuss what could be the most important point of the article: the influence of contango and backwardation. Look at the dotted line dividing 2008 and 2009. As you can see, up to this point, the price of USO closely followed the price of WTI crude. In fact, from December 31, 2007 to November 20, 2008, the correlation between the two was 0.997. Contango and backwardation were also low during this period. However, when contango spiked in late 2008, USO and WTI began to diverge. Between November 21, 2008 and March 22, 2011, when contango spiked several times, the correlation fell to 0.665. The conclusion? During periods of contango, an oil fund’s price movement will differ from the price of crude. In short, the higher contango becomes, the greater the divergence will be. Now we will analyze the degree to which contango influences this divergence. Table A below contains two periods when contango was dominant. 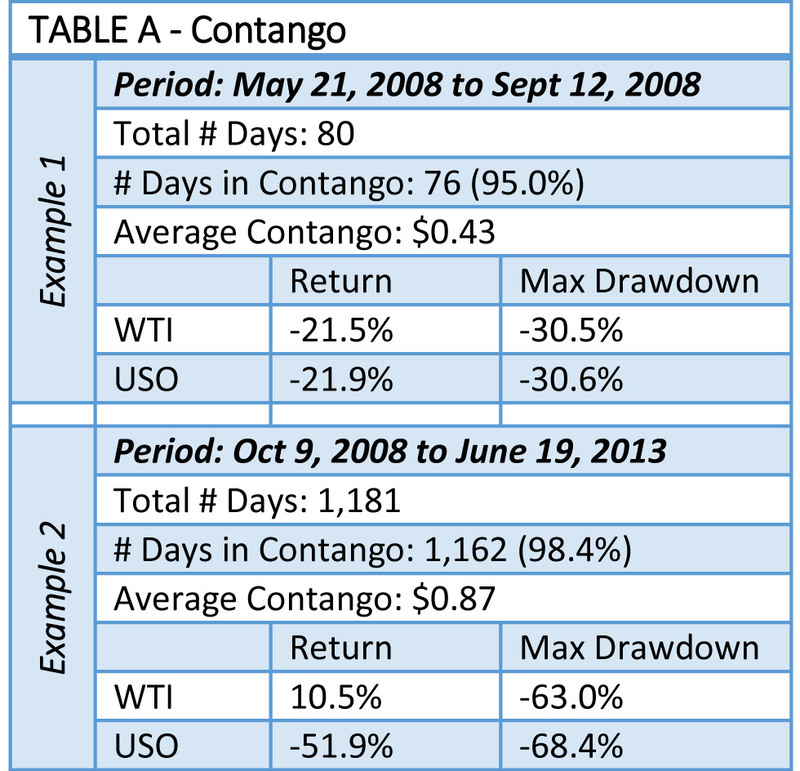 In Example 1, May 21, 2008 to September 12, 2008, contango was present 95% of the time. The average contango was relatively low at $0.43. Because contango was low, the return differential was minimal. In Table A, Example 2, average contango was over twice as high ($0.87). As a result, the return variance was significant. During this period, WTI crude oil increased 10.5% while USO’s return was negative 51.9%. Again, as contango rises the divergence between this type of fund and the price of oil is greater. This fact has little to do with a fund’s management, but rather the degree to which contango exists. Having looked at two periods of contango, we will now examine two periods of backwardation (Table B). In both periods, because backwardation was present, the fund outperformed WTI and exhibited a better maximum drawdown. It is interesting to note that the outperformance (as a percentage) was greater in Example 1 than it was in Example 2, even though average backwardation was greater in the second period. 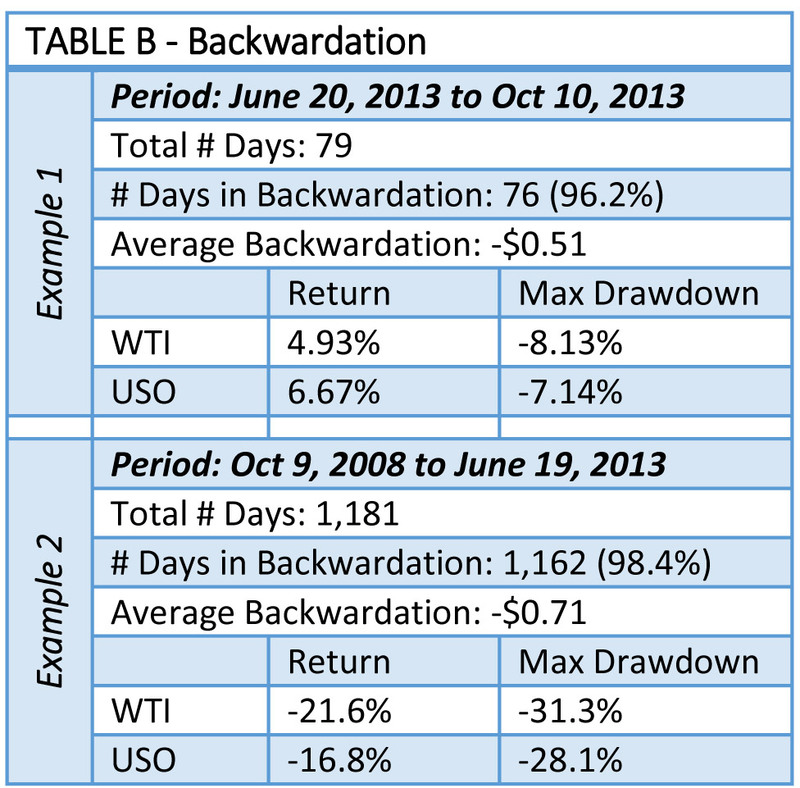 In Example 1, USO returned 6.67% versus 4.93% for WTI. This represents a 35% improvement (6.67 / 4.93). In Example 2, when average backwardation was greater ($-0.71 versus $-0.51), the outperformance was approximately 11%. Therefore, as backwardation increases, the degree of outperformance does not rise proportionately. We have learned that contango has a negative effect on an oil-tracking fund while backwardation is a performance enhancer. We have also learned that as contango increases, the degree of price divergence rises proportionately, which is not true during periods of backwardation. This is an especially important point to grasp since contango was present nearly 80% of the time during the period analyzed. Because of this, it may not be advisable to simply buy-and-hold this type of investment. It may be more prudent to use this type of security as a tactical component of a portfolio. As a final word, it would be wise to examine the slope of the futures curve before embarking on an investment in an oil-tracking fund. If contango is present in a significant way, it might be wise to hold off until it subsides or until backwardation returns. What is the bottom line? It is better to invest in this type of fund when you believe oil prices are poised to rise and contango is low or backwardation is present.